The wonders of South Dakota are on display in a high-definition television documentary from South Dakota Public Broadcasting. OVER SOUTH DAKOTA, an aerial tour, reveals our state’s beauty, majesty and splendor. 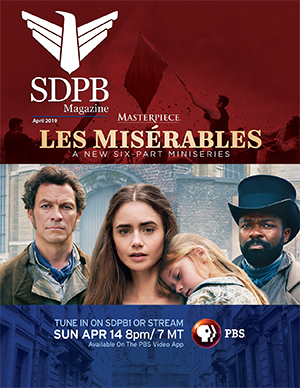 The one-hour program is a production of SDPB Television. The breathtaking high-definition production takes viewers on a birds-eye journey from the cities to the plains to the mountains. South Dakota singer and songwriter Boyd Bristow narrates. The production begins with poetic musings from Patrick Hicks, writer in residence at Augustana College in Sioux Falls; and ends with words from Badger Clark, the late cowboy poet who was the state’s first poet laureate. In between, the production soars over a dozen areas of the state, giving viewers a unique and powerful perspective of our home. The incredible vistas were filmed during the summer of 2011 by SkyWorks, an internationally acclaimed production organization, in partnership with SDPB. The project is supported by the South Dakota Departments of Tourism and Game, Fish and Parks, who will use portions of the footage for their own promotion efforts.